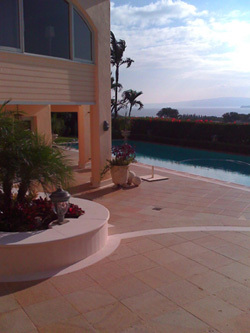 We clean, polish, hone, seal, and repair your natural stone to make it look as good as the day it was installed. New Life Marble Restoration cleans, polishes, hones, seals, and repairs your natural stone to make it look as good as the day it was installed. Using only the highest quality products, proven techniques and state of the art equipment, we can restore your floors, countertops, and any other stone surface. New Life Marble Restoration brings 7 plus years restoration in Maui working on some of the finest celebrity homes on the island. Whether yours is an interior or exterior installation, residential or commercial, New Life Marble Restoration can resolve problems from lippage (uneven floor tiles), to dull, scratched surfaces and make your natural stone or tile and grout look as good as new. GIVE US A CALL… (808) 280-7387. Have questions? Visit our FAQs page.